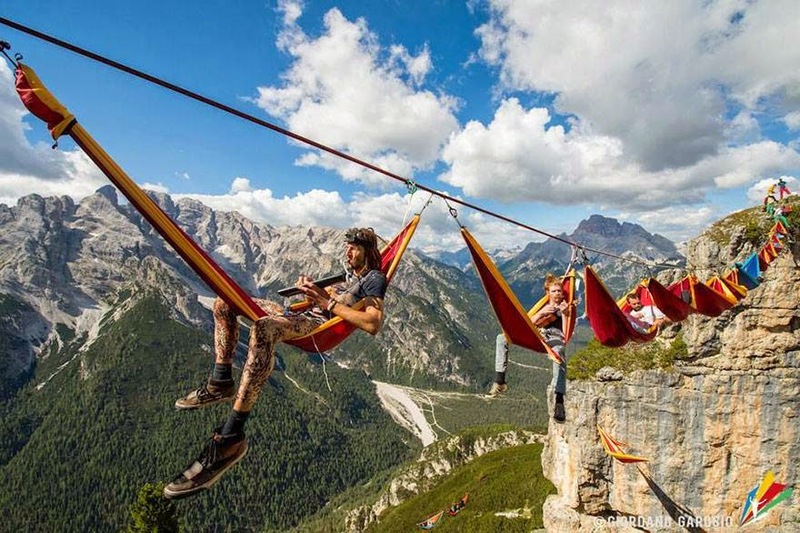 The International Highline Meeting festival seems like one of the chillest festivals we’ve ever heard of, but it also might be one of the most terrifying – attendees spend most of their time strung up on tightropes stretched across the Italian Alps in Monte Piana. The attendees call themselves “slackers” because of the slacklines they balance themselves on. This extreme sport differs from tightrope walking in that the rope has a slightly flattened shaped and has slack, meaning that it can move side-to-side or bounce. Besides the fact that the slackers spend a good part of their days (and nights) on slacklines suspended hundreds of feet above the Italian dolomite Alps, the meeting has all the trappings of a normal festival – a kitchen, a bar, and awesome musical jam sessions. Attendees can also attend a Yoga workshop or take tandem paraglider flights. Beds are overrated. What better place to wake up than suspended in a hammock thousands of feet in the air above the Italian Alps? And if you think sleeping between mountain peaks is terrifying, try walking on a tightrope between them. That’s exactly what highliners did earlier this month at the International Highline Meeting, which took place atop Monte Piana. To live vicariously through the daredevils and thrillseekers pictured above. Ah, there’s nothing quite like lounging in a hammock, the wind whistling through your hair, hundreds of feet in the air. Hold on… hundreds of feet? That was the scene this year at the International Highline Meeting. An event that brings together high altitude thrill seekers from around the world and took place this time at Monte Piana in north-eastern Italy. The attendees call themselves “slackers” because of the slacklines they balance themselves on. This extreme sport differs from tightrope walking in that the rope has a slightly flattened shaped and has slack, meaning that it can move side-to-side or bounce. Besides the fact that the slackers spend a good part of their days their days and nights on slacklines suspended hundreds of feet above the Italian dolomite Alps, the meeting has all the trappings of a normal festival — a kitchen, a bar, and awesome musical jam sessions. Attendees can also attend a Yoga workshop or take tandem para glider flights.